Silver is an ancient and natural all-purpose healing agent. For centuries, it has been regarded as a versatile healing tool that has helped heal wounds and aid in fighting off bacterial infections. Though it saw a decline in usage in the middle 20th century, it has since seen a resurgence and is, nowadays, used for an array of ailments. 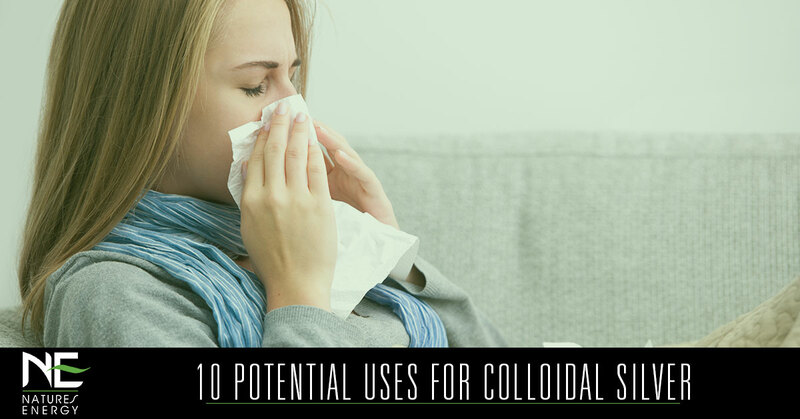 In today’s blog, we at Natures Energy would like to share with you some potential colloidal silver uses. As leading nutraceutical manufacturers, we take pride in creating the highest quality supplements and vitamins in the most bioavailable form—Natures Energy Colloidal Silver included. Learn more about Natures Energy here, and shop our all-natural supplements here. The following is a list of possible uses of colloidal silver. Improve ear infections. Some studies show that by adding ten drops in the ear, letting it sit for two minutes, and then tipping it out, you can speed up the recovery of ear infections. Reduce inflammation. Research shows that silver nanoparticles (found in colloidal silver) have anti-inflammatory properties that can help reduce swelling and boost cell recovery. Boost immune system. Silver supplements have the capability of killing harmful microbes and has shown signs of fighting infection and boosting the immune system. Additionally, it is highly unlikely that you can develop an antibiotic resistance to silver. Speed up eye infection recovery. Similar to ear infections, adding two drops of pure colloidal silver formula into the eyes can help cure pink eye, sty, and other eye infections. Soothe rashes and itches. Some users claim that silver has many topical uses and is helpful in treating insect bites, skin rashes, and even burns. Improve healing. When used as a topical antibiotic, pure colloidal silver has shown promise in promoting the healing of boils, sores, and cuts. Kill foot fungus. Silver supplements work by disabling an enzyme that fosters action inside anaerobic cells. These cells exist in fungus, bacteria, and viruses, therefore, making pure colloidal silver ointment helpful in killing athlete’s foot and nail fungi. Help burns heal. Silver has shown signs of soothing and furthering the healing of burns, especially sunburns. Fight off colds. Because of its antiviral properties, silver supplements have been reported as helping to prevent colds and flus and speed up recovery. Control sinus infections. By applying a few drops of silver into your nasal cavity, the supplement can potentially destroy the infection and even reduce asthma. This is in no way a comprehensive list of true colloidal silver uses. It is a mineral that can benefit the body in numerous ways. However, it is important to use proper dosage and usage. Natures Energy Colloidal Silver is professionally evaluated by our nutraceutical team to ensure optimal purity and safety. Our rigorous standards and processes ensure that all of our vitamins and supplements come to you in their raw, natural, and most advantageous form. Shop our all-natural supplements here. Colloidal silver is not a medication or a drug, and the above statements have not been evaluated by the FDA.